As well as buying my family and friends main Christmas presents, I always like to throw in a few stocking fillers as a little something extra. Over the past few years, I've found a few shops that offer the perfect stocking fillers. This is probably my 'go to' stocking filler store. Hotel Chocolat sell such amazing chocolates and have such a wide variety of options. The slightly more premium feel of them, makes them that bit more special compared to other high street brands of chocolate. Also, they're reasonably well priced and often offer multi buy deals which makes them really good value for money. Lush offers great gifts. There's so much to choose from with a range of price points, meaning that they're ideal for stocking fillers for all ages. The Body Shop is one of my favourites stores and always launch an amazing Christmas range. 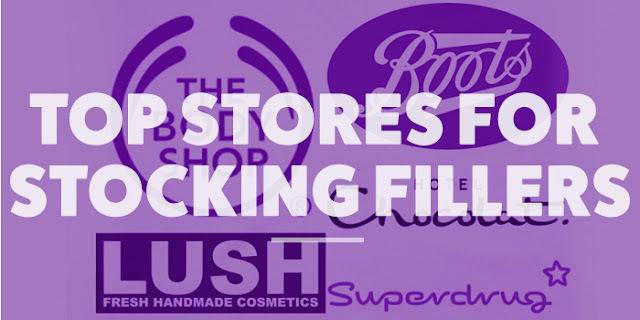 Similar to Lush, they have a huge selection of products with a range of price points, meaning there's always something for everyone there. Boots is a great stop for Christmas presents as well as those smaller stocking fillers. Boots always have such amazing deals at Christmas and again cover a range of products for both males and females from a range of categories so it's not just beauty items you can stock up on there. I know some people manage to do all their Christmas shopping in Boots although I like to pick up a few stocking fillers from there, I definitely don't manage to get all my Christmas shopping done at Boots! Similarly to Boots, Superdrug offer a wide range of gifts and at really good value too. They offer some great deals which means you can multi buy a variety of products on quite a small budget. Superdrug always have really good deals on tubes of chocolates so when I was a student I always used to stock up on those for friends. What are your top stores for stocking fillers? I'd love to find Lush and Hotel Chocolat goodies in my stocking this year! That would be fabulous.